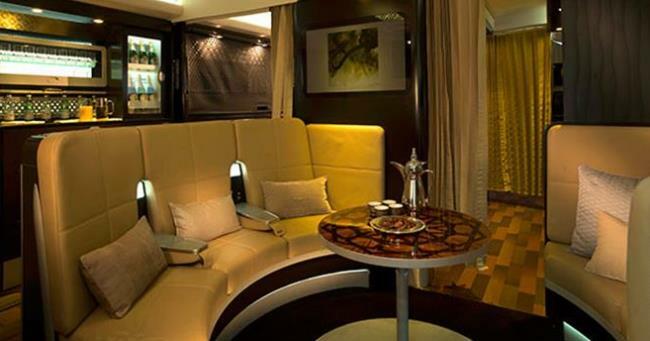 Channelling both boutique hotels and the design of private jet interiors Abu Dhabi-based Etihad Airways launched its 're-imagined' first and business class this month (May). Developed under hush-hush high security for the last five years the new look will take to the air this December when the airline rolls out its 10 new Airbus A380s and 70 plus new Boeing 787's. So what is on offer and why has it caused such a stir (The campaign even includes Dannii Minogue screaming with delight when she first sees the on board 'Suites')? The most shriek-worthy offering is clearly the new 'beyond first' two-person Residence class available on the new A380s (Only one per aircraft). New First-class Apartments will also be available on the A3*0s ,while the new Business class Studios will featured on both its A380s and B787s. The design ethos is to combine embraced Arabian traditions with Modernism. 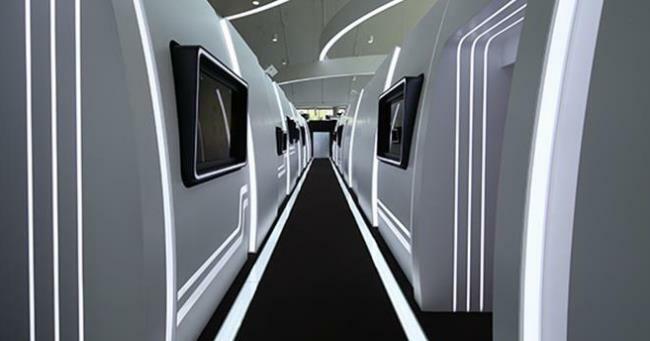 And it goes without saying that the planes will also be all 'teched up, with the latest Panasonic eX3 entertainment system, (providing more than 750 hours of on-demand entertainment and HD screens). The A380 aircraft will have full mobile and Wi-Fi, the B787 will has Wi-Fi. 'What we have endeavoured to achieve on the A380 is the same experience as you would get on a private jet or yacht. It will redefine the luxury travel experience. If you were taking a private jet, it would cost $100,000 to $160,000 and we believe our product is far superior,' Etihad CEO James Hogan says. There will only be one of these uber-suites on each aircraft costing upwards of $20,000 between Abu Dhabi and London, the inaugural route. Taking over the forward upper deck of the A380, the 38sq mt (125 sq ft) self-contained Residence will be spacious enough for two people to relax spread out in what amounts to a private living room, double bedroom (with Poltrona Frau upholstered (double bed with custom-made mattress) bathroom and shower. You'll also get the services of a Savoy-trained personal butler. A door and passageway separate the living room from the master bedroom and the ensuite shower room. The Luxury Travel Bible notes that sadly no upgrades to the Residence will be given, 'We are going to be very pure on price with the Residence. It is exclusive and we want people to aspire to it,' says Hogan. Although frequent travellers will be allowed to trade in their miles for three or four times the normal first-class rate. There will only be one of these uber-suites on each aircraft costing upwards of $20,000 between Abu Dhabi and London, the inaugural route. Taking over the forward upper deck of the A380, the 38sq mt (125 sq ft) self-contained Residence will be spacious enough for two people to relax spread out in what amounts to a private living room, double bedroom (with Poltrona Frau upholstered (double bed with custom-made mattress) bathroom and shower. You'll also get the services of a Savoy-trained personal butler. A door and passageway separate the living room from the master bedroom and the ensuite shower room. The Luxury Travel Bible notes that sadly no upgrades to the Residence will be given, ?We are going to be very pure on price with the Residence. It is exclusive and we want people to aspire to it," says Hogan. Although frequent travellers will be allowed to trade in their miles for three or four times the normal first-class rate. 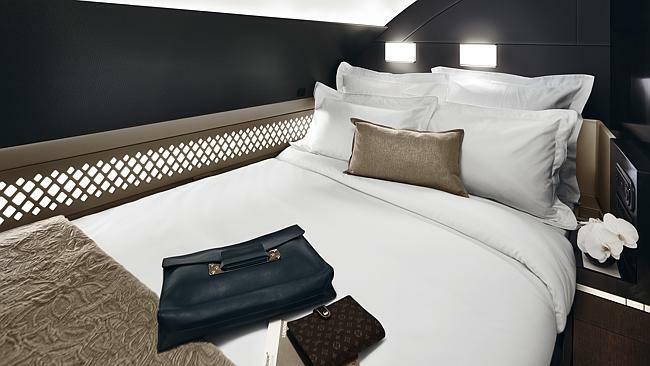 'On the A380, we?re introducing the first apartments on an aircraft in the world. It is a sitting room and a bed. It is exclusive to the A380 and will be the largest first class in the sky,' Etihad CEO James Hogan says. There will be nine First class Apartments each 3.6 sq mts ( 39 sq ft). Apartments arranged either side of a central aisle to give more space back to the passenger. They are decked out with a separate reclining lounge seat and full-length bed ((2.04 metres) as well as a chilled mini-bar, personal vanity unit, wardrobe and a sliding door. For those travelling together for business or pleasure six will have interconnecting doors. There is also a shower and changing room for first-class Apartment guests. A lounge area will be positioned between the first- and business-class and will be shared by both cabins. Business just got better with the new Studio suite. The suite has a 56cm (22 inch) wide seat and separate ottoman which together form a flat bed, 2.04 metres (6.8ft )long . Each passenger gets a sturdy side table and plenty of storage under the ottoman plus a top-loading cupboard. There are also plenty of lighting options with a side lamp, reading lamp and even some mood lighting. The Boeing 787 will have a separate first-class product from the A380, but both aircraft types will feature business class Studios in a 1-2-1 layout so everyone has access to the aisle. The A380 will have70 Studios, the 787 will have 28. Etihad?s 787s will be a mix of two-and three class aircraft. Those equipped with first class will have eight Suites. Should The Luxury Travel Bible readers ever find themselves flung out of First it is good to know that both the A380 and 787 will be fitted with economy Smart Seats, with a 'fixed wing' headrest for passengers to sleep against. The A380's first route will be London Heathrow from December 27, destinations including Melbourne, Sydney New York, Paris Charles de Gaulle and Sydney. The 787 with two- and three-class cabin, depending on the route will ultimately fly to 40 destinations including Washington, Dusseldorf and Mumbai. The plan is to refit the current fleet to the new standard over the next four years. The design process for Etihad's A350 and next generation 777s interiors has already begun, they'll echo the style of the A380s.